Sensitive and private data used for completing purchases happen over a SSL secured communication channel and is encrypted and protected with digital signatures by and on an off site url managed, owned and operated by infusionsoft.com. The ARMory Power Pitching Academy and/or FLORIDA BASEBALL RANCH, INC. makes no warranty, implied or otherwise regarding the secured checkout operations of InfusionSoft.com. 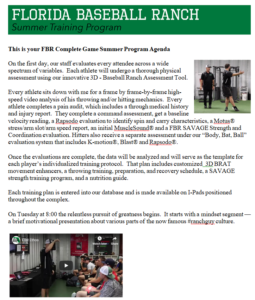 The ARMory Power Pitching Academy and/or FLORIDA BASEBALL RANCH, INC.